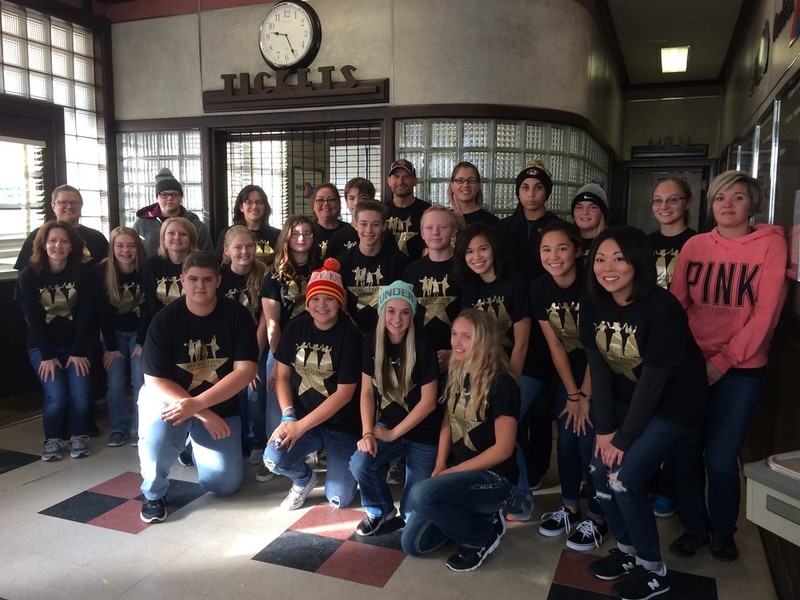 On October 24, 16- 9th graders, 7 parents, Mrs. Poe and Mrs. Kliethermes left from the La Plata Amtrak station for their adventure in Chicago. The students had started raising money last February in order to go see the hit Broadway musical, Hamilton. Upon arriving in Chicago, the group was greeted with their first glimpse of the city through a light rain. They walked to the stop for the water taxi and after a brief wait, hopped aboard and enjoyed a calm ride past some amazing sky scrapers and other historic buildings on their way to Michigan Avenue. At their stop, the students were able to get an up close look at Trump Tower before walking a few blocks to their hotel. After checking in, the group made their way to the Hard Rock Cafe for dinner before the show. Then a quick walk to the theater and it was time for Hamilton!! The group enjoyed the much anticipated performance and it lived up to all of their expectations. After the show, the group was greeted by a local tour guide who led them back to the hotel while telling local history stories along the way. A brief stop at Baskin Robbins for ice cream was in order, even though it was a little cold, but the group enjoyed their treat along with the stories being told by Gilbert, the tour guide. The next morning, the group enjoyed an amazing breakfast at the hotel including made to order omelets, pancakes, and a wide assortment of other foods to fill their bellies before their big day of touring. The groups' first stop was at Chicago 360 (formerly the Hancock Tower). Many of the group experienced a thrill there called "Tilt" where the side of the building tilts out leaving you practically face down 1000 feet above Michigan Avenue from the 94th story of the building. Some of the students and their parents chickened out but others loved it and were willing to go again and again! After this, the group strolled down Michigan Avenue taking in the sites of the various stores like Bloomingdales, Tiffany and Company, The Disney Store and a superhero experience at the AT&T store. A stop at a Ghirardelli chocolate store was a hit with many of the group. One more stop provided a photo opportunity at "the bean" or the sculpture called Cloud Gate. Next the group walked to Giordano's for their world famous deep dish pizza. After filling up and a much needed break from walking, the group took a quick stroll around Willis (formerly Sears) Tower before boarding the train for the trip home. The train ride home was a time to rest, visit about all the group had seen and to start planning for the next adventure, Easter in New York City!